Susan E, Becker | Colorado Mesa Univ. Susan E. Becker, PhD, received her Bachelor of Science in psychology from Reed College in Portland, Ore. and went on to earn her Master of Science in clinical psychology from the University of Colorado-Colorado Springs and her PhD in clinical psychology from the University of Arizona. Becker is a professor of psychology. She teaches Counseling Processes and Techniques, ASIST Suicide Intervention Skills Training, Introduction to Marriage and Family Counseling, Psychological Testing, Career Development and Group Processes, among other courses. Her scholarly interests focus on leadership development, human change processes and suicide prevention/ program evaluation. Becker takes an active learning approach to all of her courses, where student discourse, questions and active experiences enhance the learning process. In the counseling curriculum this includes skill-based practice as well. One objective she has for counseling majors is to be excellent communicators one-on-one, leading groups, presenting information professionally and in their written work. Course goals and projects reflect this overall learning objective. Becker facilitates student-structured research every academic year. This includes working with teams of students on their own research, on her projects and facilitating students involved in program evaluation research with organizations in the community. Examples of off campus research sites include St. Mary's Family Practice, the Homeless Coalition of Mesa County and Western Colorado Suicide Prevention Foundation. 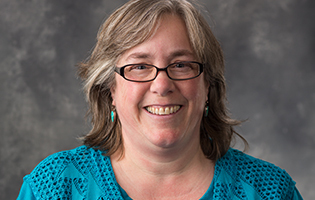 Becker has devoted her career to training undergraduates in the introductory skills of clinical and counseling psychology, leadership and team building and suicide intervention training. She was named Distinguished Faculty by CMU in 2005 for her work mentoring undergraduate research. She has served as the Rocky Mountain Region Vice President for Psi Chi - the International Honor Society in Psychology since 2011. She has been the Psi Chi chapter adviser since 2003, where she has helped her chapter become leaders in community service. Becker chairs a number of key committees as a board member of the honor society.